If you’ve never made your own bread before, this is where you should start. It requires absolutely no special equipment or ingredients, it is easy to work with, the result is practically guaranteed to be delicious, and everyone loves it. You can’t mess this up. 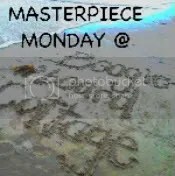 So make it. I promise, it’ll turn out just like mine. 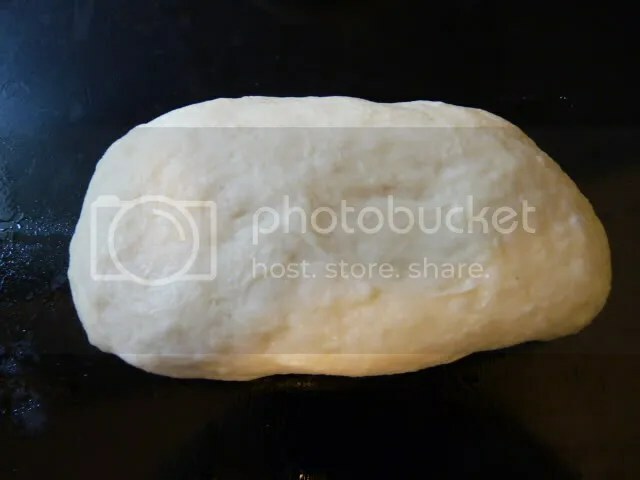 This is an “everyday bread.” It is a good candidate for your standard bread recipe that you can adjust in a thousand ways to make any other kind of bread you can think of. Start with this basic recipe, and then go from there. A very common beginner mistake with baking bread is to take a recipe and start with the amount of water written in the recipe. 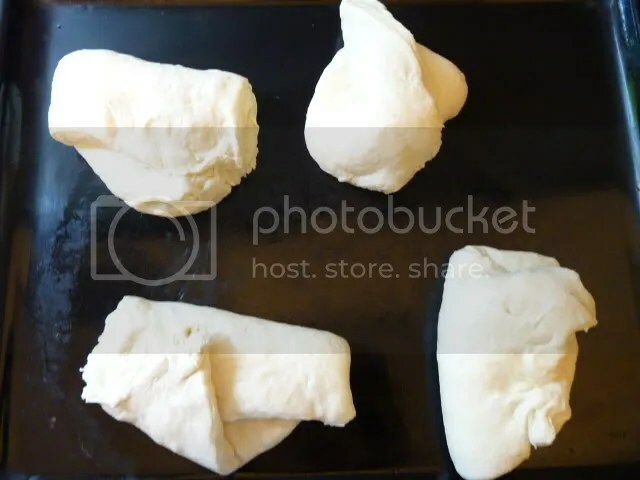 Many recipes will say something like “500g flour, 375 mL warm water.” If you start with the amount of water in the recipe, very often you will end up with a very wet dough, and you’ll need to use more flour. That in turn will throw off your proportions. It’s not a huge deal, but it’s good to know: the amount of water that you use has very little to do with what the recipe says, and everything to do with the humidity in your home, and the age and method of storage of your flour. I don’t have high humidity in my home, but my flour is always more moist than what most American recipes call for. I almost always need to use significantly less water than the recipe says. You can always add more water later if you need it. I often use half or 2/3 of the water in a recipe to start. It’s nearly always enough! 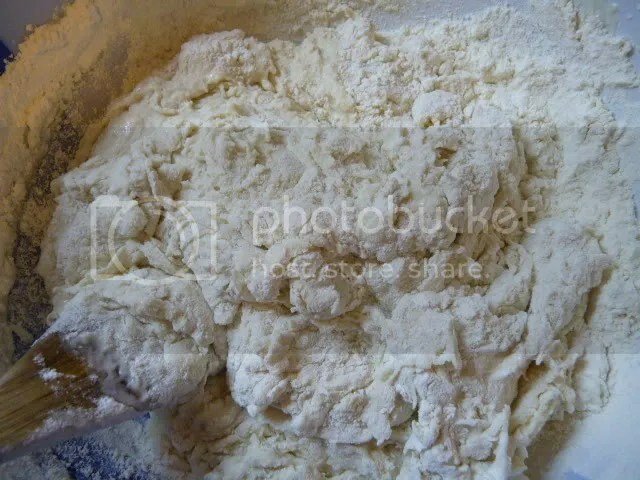 Meanwhile, while the yeast is doing it’s thing in the bowl, measure your flour. For this recipe, we’re using all purpose flour, which you probably already have on hand, and if you don’t, it’s the cheapest flour on the market. 500g is a good amount of flour if you’re just starting out. It makes 4 slender baguettes, and the dough is very manageable in size. Very small amounts and large amounts of dough are more difficult to work with. Of course you can halve, double, triple, or pi this recipe. It will all work out in the end. 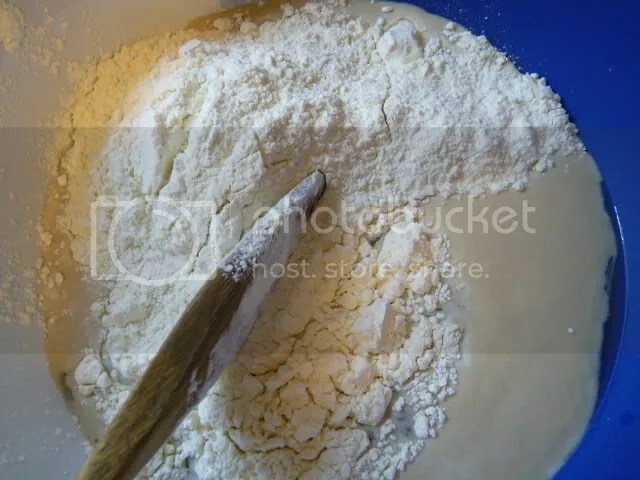 Put about half of your flour into the bowl with the water and yeast. Stir. Like I said, no special equipment required. Just a wooden spoon. Aim for this consistency. It should be like pancake batter, that is, pourable but slightly sludgy. At this point, add the salt. French bread is salty, that’s why it tastes so good. Stir again. Adding salt at this point makes it easy to stir it in so that it is well dispersed. 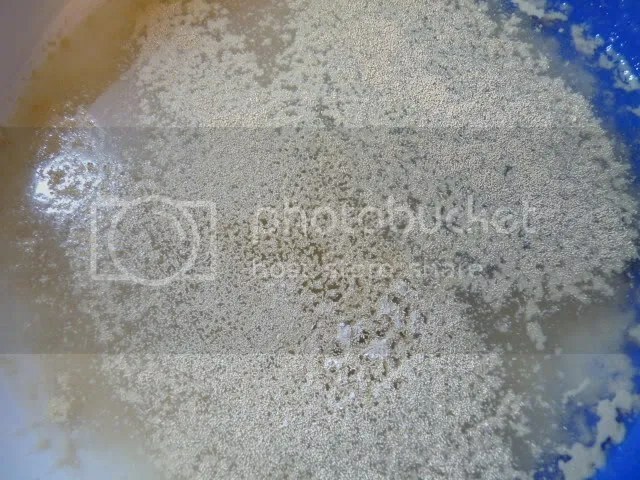 Some recipes will tell you to mix the salt into the flour before adding it to the water, or to put it in with the yeast before the flour. But I recommend doing it this way. 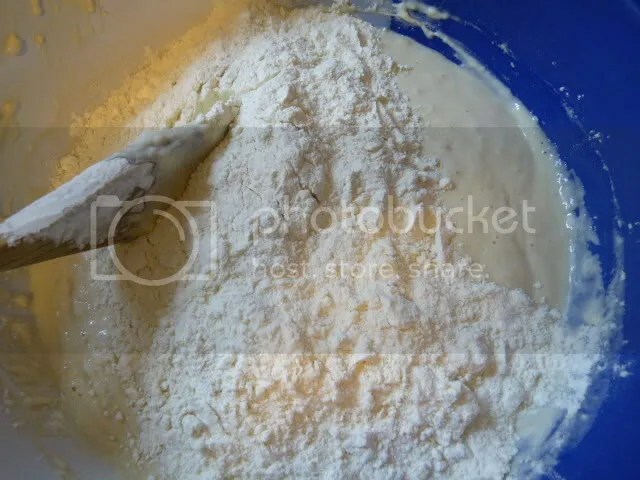 Continue stirring in the rest of the flour. You want to stir in all of the 500g of flour. The texture will start to change. It will start to develop little pieces and flappy bits. That’s okay. Keep stirring. As you branch out into other flours, you will discover that each flour acts very differently as a dough. All purpose flour is extraordinarily soft and flappy compared to other flours. 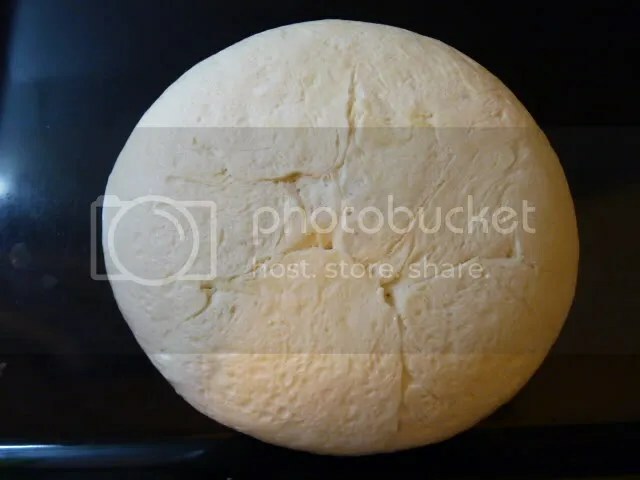 When you sense that stirring your dough is no longer possible or pleasurable, flour a surface – I use my countertop, it’s easiest, just make sure it’s absolutely dry, and sprinkle all purpose flour on it. 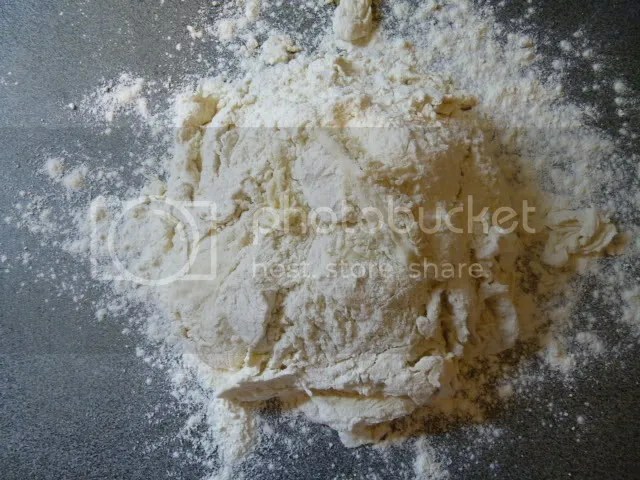 (Even if you are using a different sort of flour to make bread, all purpose flour is the best for sprinkling your surface). Flour your hands also. Don’t worry about how much you use. I put a lot of flour down because I know I’m going to end up needing more later anyway. 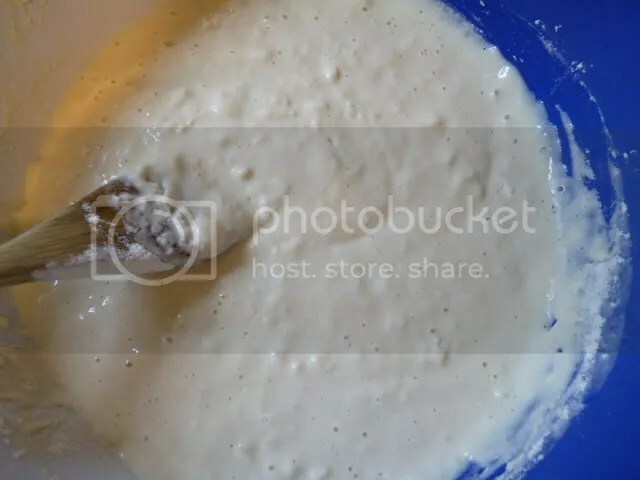 Then ‘pour’ your dough onto the surface. Scrape whatever you can out of the bowl and let that fall onto the dough as well. Now you need to knead the dough. Kneading is easy, and shouldn’t intimidate anyone. Many people have their own ways of kneading. 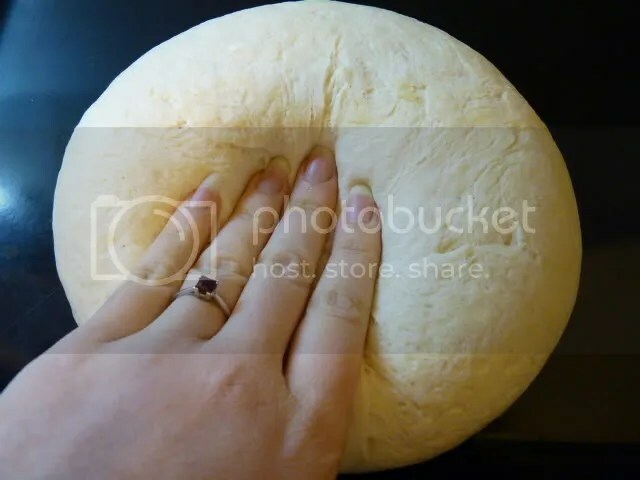 I have a kneading tutorial that will show you how I do it. I hope you’ll give my method a try. 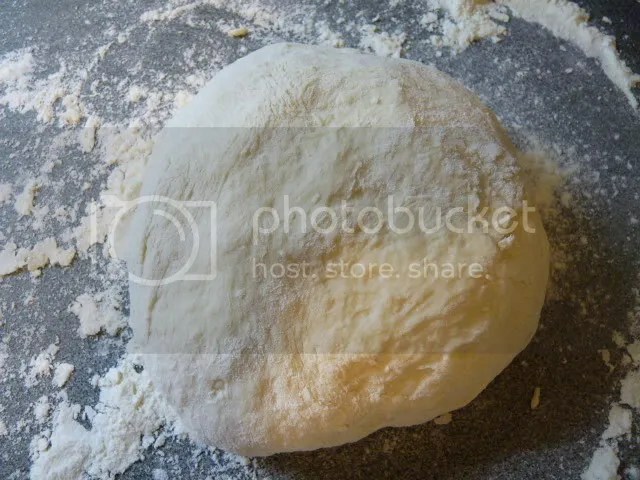 If the dough sticks to the surface or your hands, dust with more flour. 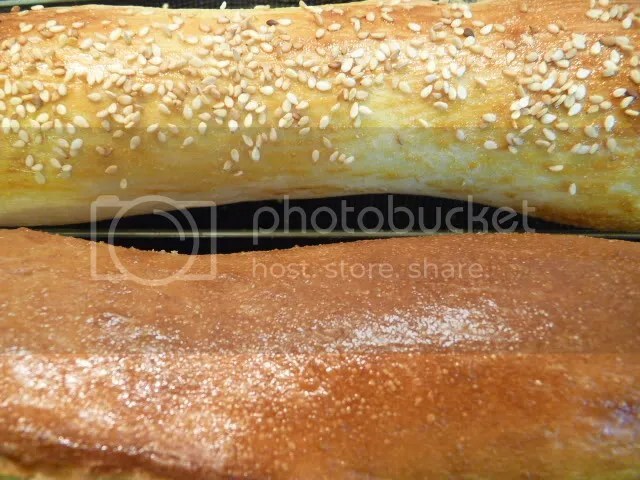 There is a difference between “sticking to your hands” and “sticky dough.” The difference is a little stickiness in bread dough is a good thing, but you don’t want to be peeling bits of dough off your hands. 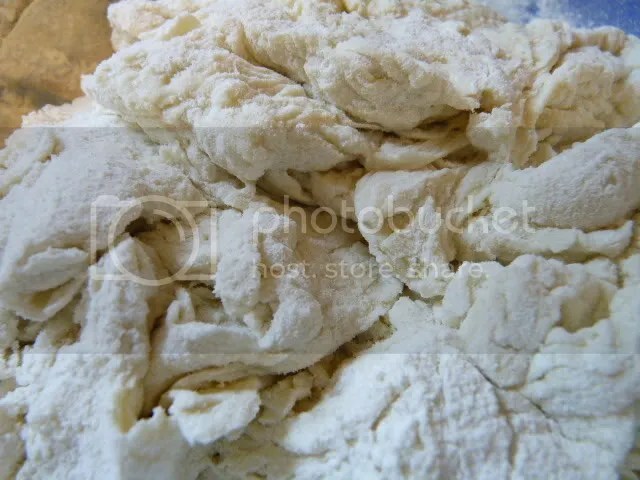 Don’t over-flour: only add as much flour as you need to keep it from sticking excessively. Brush a few drops onto the dough. This will prevent the dough from sticking to the plastic wrap that we’re about to put on top. 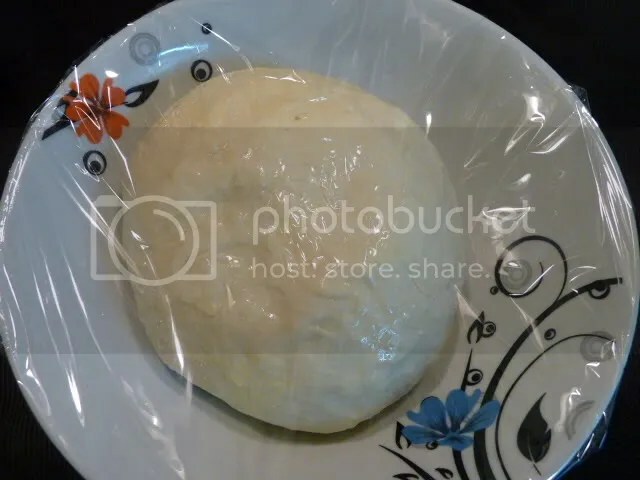 Your dough will rise and press against the plastic wrap, so the oil will come in handy. If you have an olive oil mister like a Misto, you can certainly use that instead. 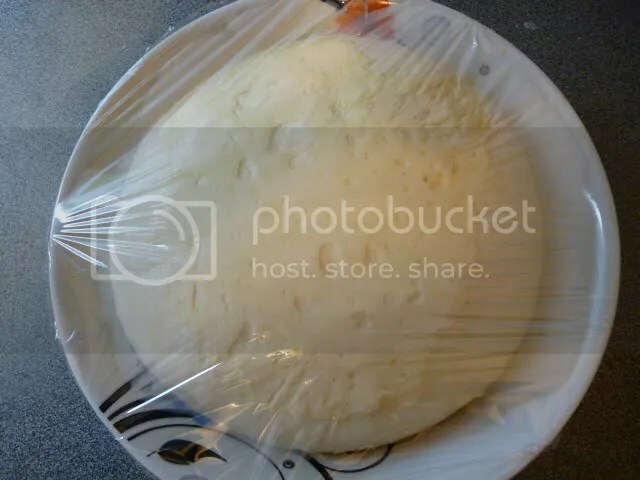 Cover with plastic wrap and then place a kitchen towel over it. The plastic wrap keeps the dough from drying out, and the kitchen towel keeps it in the dark (yeast like dark). 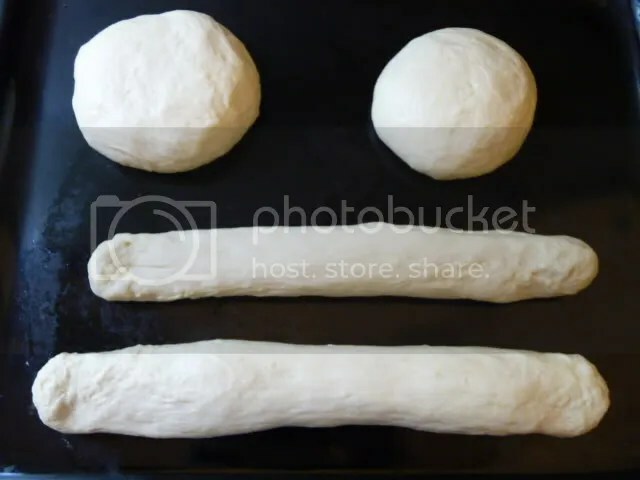 Let your dough sit like that for 90 minutes. In the summer, you can put it outside and rise it in half that time if it’s hot. You don’t need to worry about putting the bread in a warm place. 90 minutes at room temperature will rise your dough and develop the flavor just right. After 90 minutes, check that your dough has in fact doubled in size. 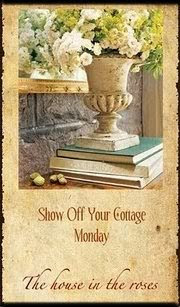 Remember that it will not be twice as high unless you are rising it in a true cylinder or rectangular container. 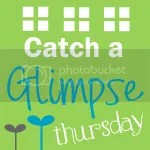 In a bowl, the sides widen as they go up, so doubled in size might only be a third higher. I usually get out a baking sheet or a piece of wax paper for the next part. 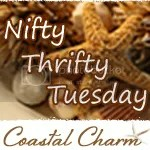 Overturn the bowl over the baking sheet or wax paper and shake gently. 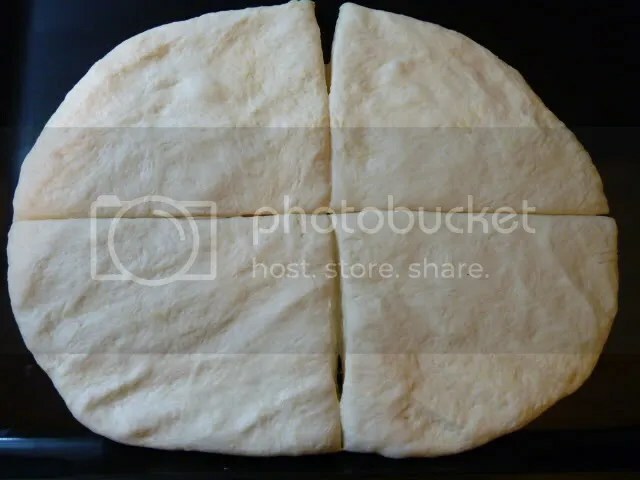 The dough will fall onto the baking sheet by itself. If it sticks, tap on the bottom of the bowl. 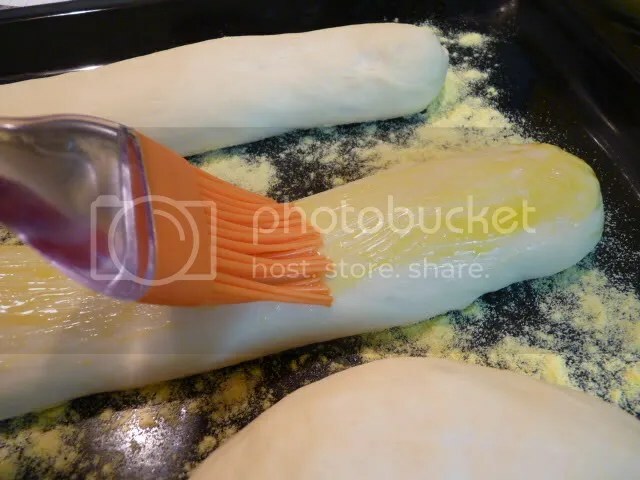 Using your fingers, gently press on the dough, which will spread it out in the pan. This process is calling “punching down the dough.” Many people take that phrase literally. You should not be punching. Just pressing gently. The idea is to press out the air bubbles (created by the respiration of the yeast) to allow the yeast to create more. You decide how many loaves of bread you want. This recipe will make four slender baguettes or two thick ones. You could make three, or one large loaf if you want. You could make many small rolls. The recipe doesn’t change, but the cooking time does. Ovens vary anyway, so as long as you remember that smaller breads cook faster, and remember to keep an eye on them, you don’t need to be told exactly how long to bake them. 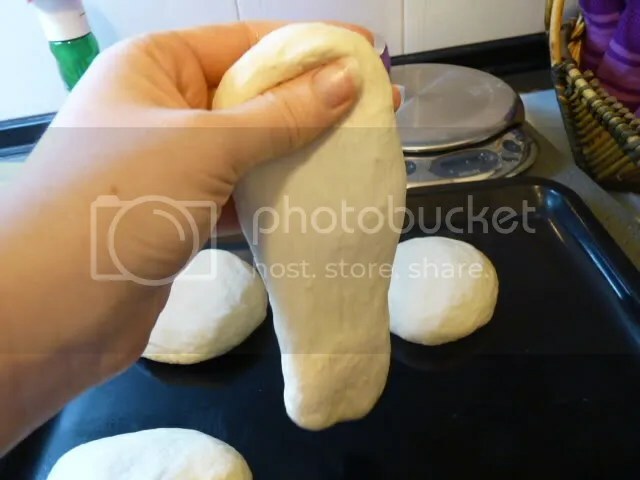 Pick up your dough and hold it at one end so that the other end is hanging down. 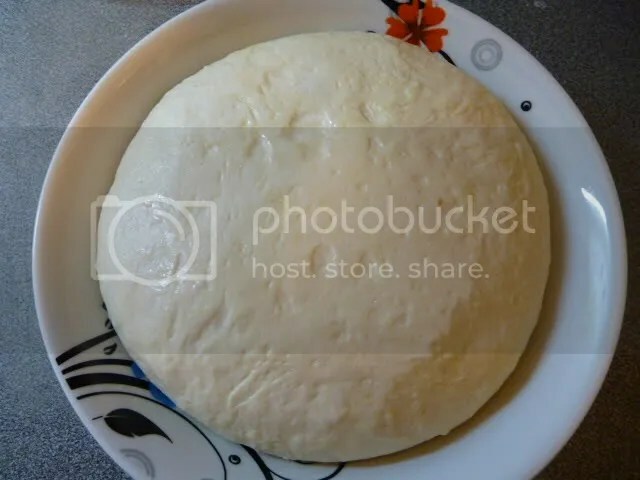 It’s own weight will start to lengthen the dough. Gently roll the end over itself and press, to form a nice end. 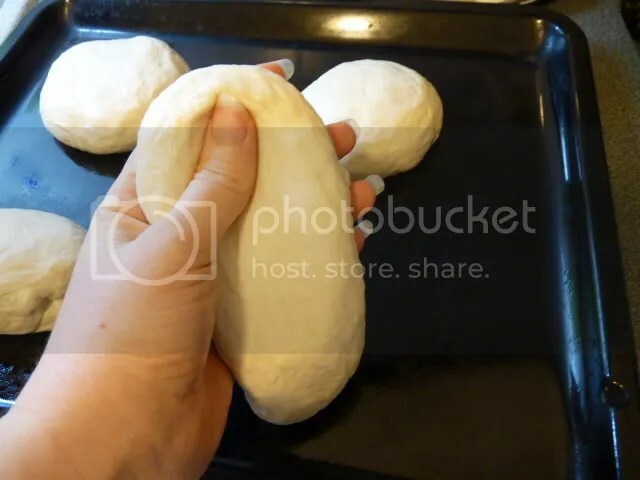 Hold the other end, letting the dough hang. Form the other end. Do this several times, changing which end you hold. Your baguette will lengthen on its own. If your baguette needs a little help, you can press along the length of the baguette which will help it along. Remember not to make your baguettes as long as your baking sheet! They will bake up larger than they are now. You will need extra space between them and on all sides. 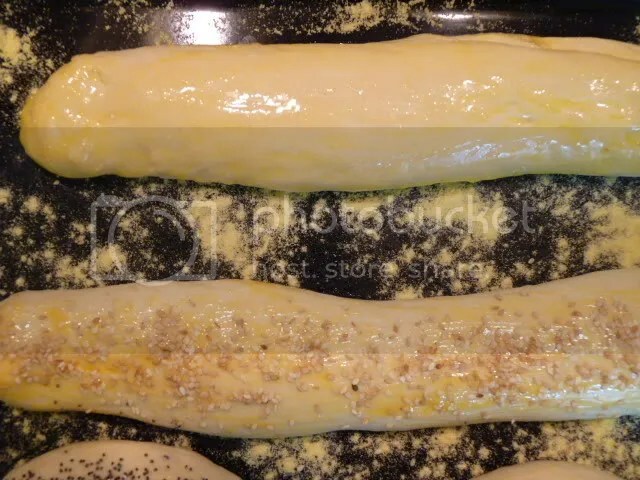 Sprinkle cornmeal liberally on a baking sheet and arrange the formed baguettes on it. Let them sit, uncovered, for 45 minutes (in summer outside for 20-25 minutes). When the 45 minutes have passed, it’s time to glaze your bread. You can use water, milk, egg white, egg yolk, or whole beaten egg. Water and milk give a matte finish. 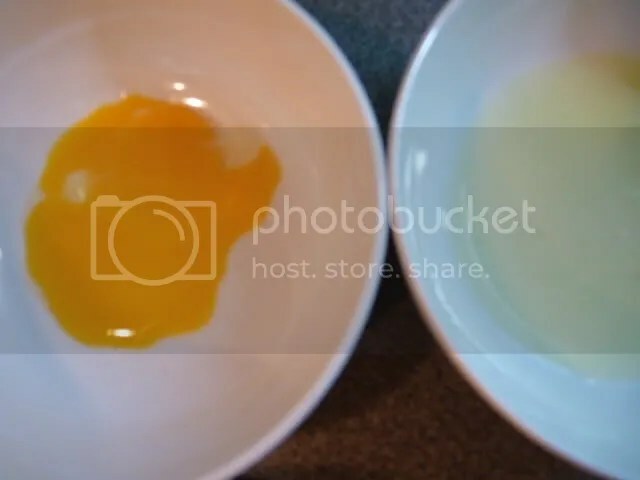 Egg white gives a shiny yellowish finish. Egg yolk gives a shiny brownish finish. Whole beaten egg gives a shiny orange-red finish. You can do several and compare them. 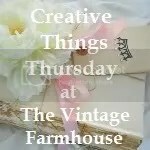 Use a pastry brush if you have one, or just the tip of your finger, to apply the glaze. 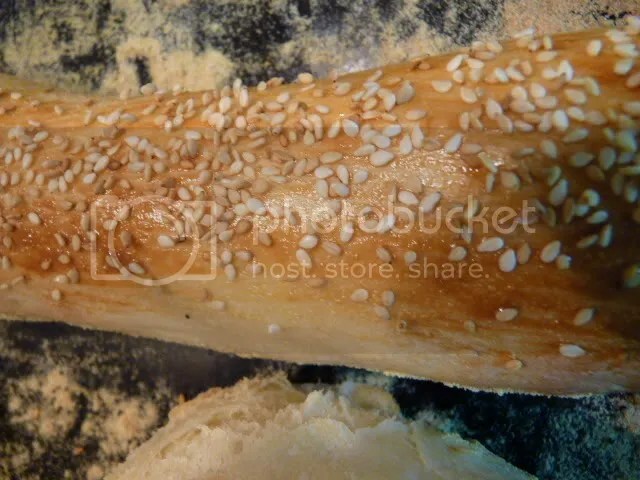 If you want, you can sprinkle sesame seeds on your baguettes. I usually like to do some with and some without. And of course, there are many other seeds and toppings you can use! Make sure your oven is fully preheated and that there is space around your loaves. Pop your baking sheet in the oven quickly. You don’t want too much steam to escape. 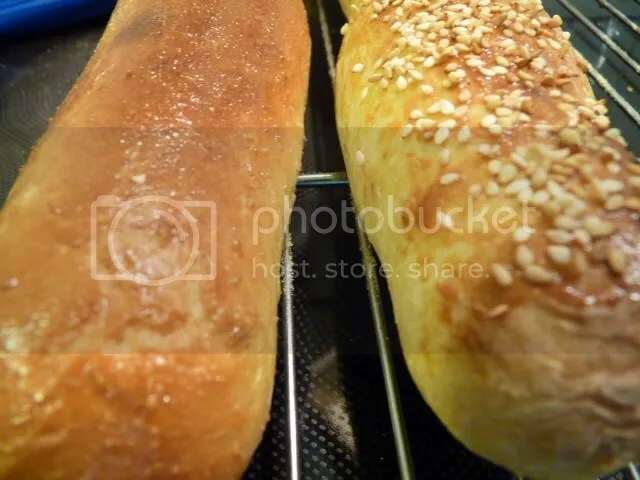 After 5 minutes of baking, move the loaves a little bit on the pan to make sure they aren’t sticking, and lower the heat to 220 degrees Celsius and allow to cook for another 8-12 minutes. I like to take them out at the 8 minute point and tap on the bottom of the loaf. If it sounds hollow, it’s done. If you’re doubtful, put it back for a few more minutes and try again. When they are finished, they will be golden and hollow-sounding when tapped. Put them on a wire rack and let sit for about an hour. Then serve! They’re delicious with just about anything. Makes 4 slender baguettes or 2 thick ones. 1. 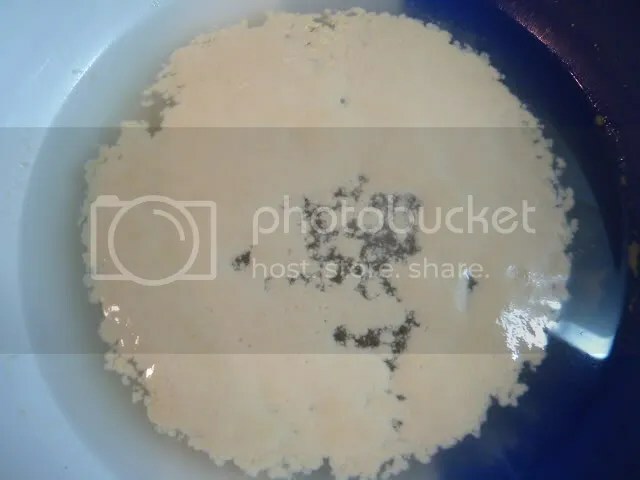 Proof yeast: in a large bowl, sprinkle yeast and sugar over warm water. Wait 10 minutes until foamy; if it does not foam, throw it away and start over with new yeast. 2. 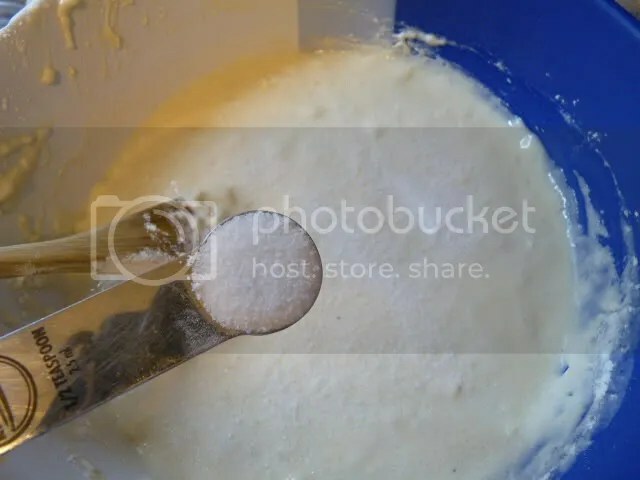 Stir 250g of flour into the water-yeast mixture. Sprinkle salt on top, stir well to combine. 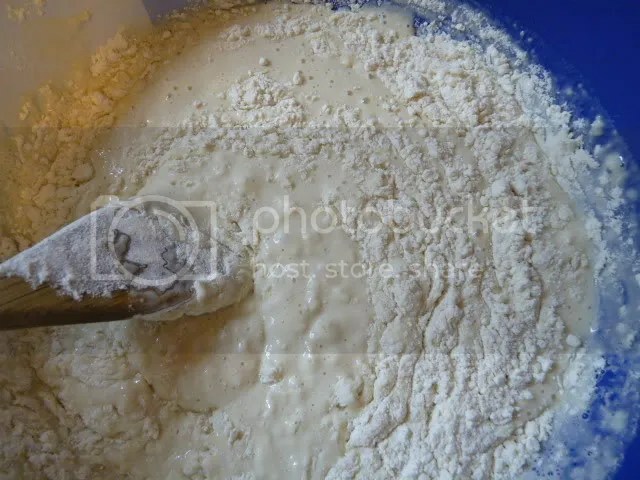 Stir in remaining flour. 3. 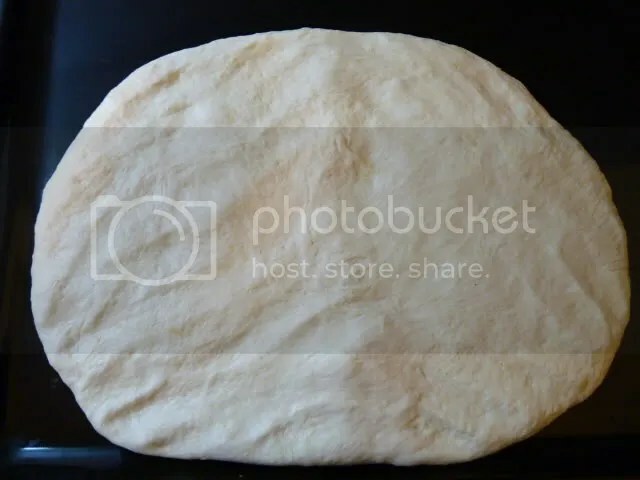 On a well-floured surface and with floured hands, knead dough 5 minutes. 4. 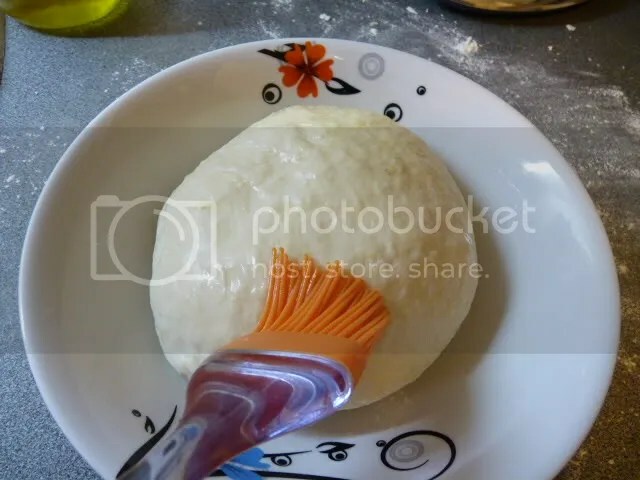 Oil bowl and place dough in bowl; brush dough with remaining oil. Cover with plastic wrap and kitchen towel and allow to sit for 90 minutes. 5. 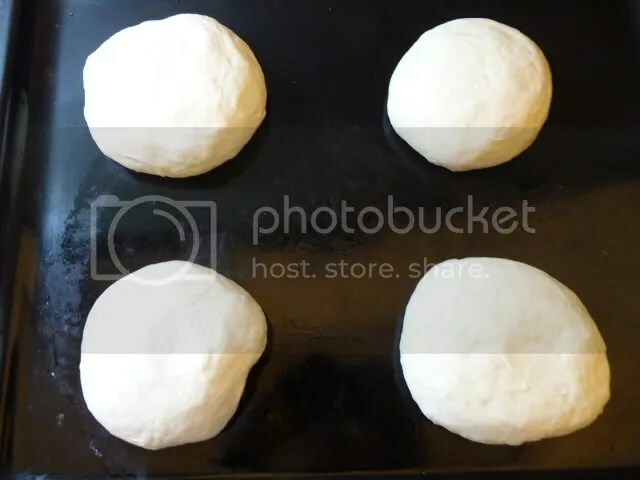 Place dough on surface. Press out air with fingers. Divide into four equal pieces. Form baguettes. Place on baking sheet. Allow to sit uncovered 45 minutes. Preheat oven to 250 degrees C. Place a bowl (ovensafe) of water on the floor of the oven. 6. 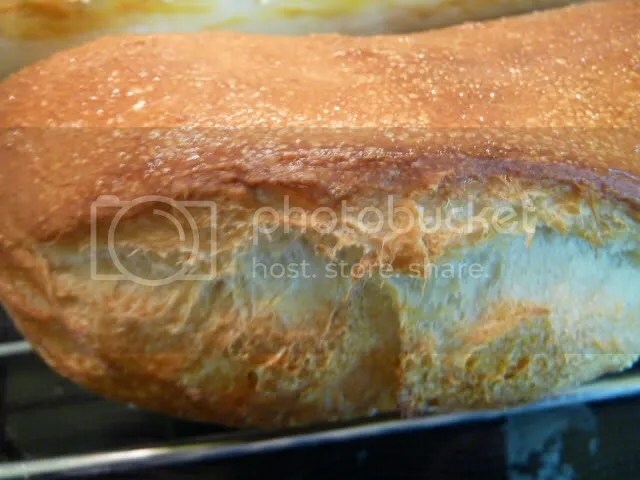 Glaze loaves with water, milk, egg white, egg yolk, or beaten egg. 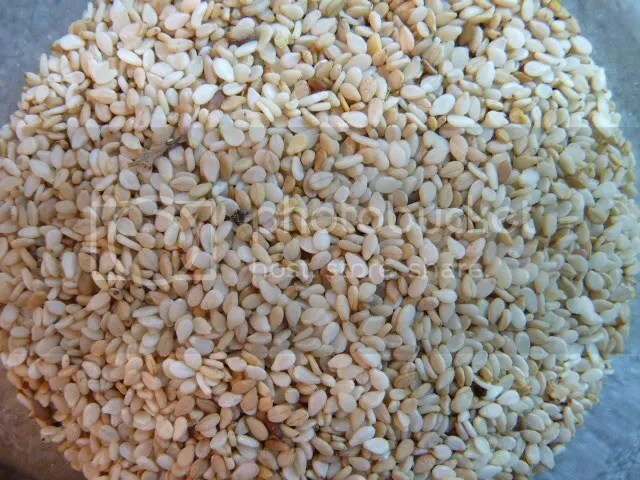 Sprinkle sesame seeds if desired. 7. Bake 5 minutes, reduce heat to 220 C, continue baking another 8-12 minutes until done. 8. Cool on rack for an hour before eating. thiamin, niacin, selenium, riboflavin, folic acid, and manganese. Wow! This looks good 🙂 Will it go well with pesto spread and some white cheese? And don’t forget the Hot Choco or Strong coffee! Love it! 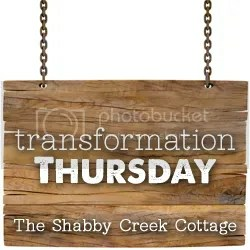 Looks great, I’ll have to try this. I routinely leave salt out of my recipes, I had to cook for my dad and he had a salt problem when I was learning to cook, just got used to it. I’ll have to try this with and without the salt. 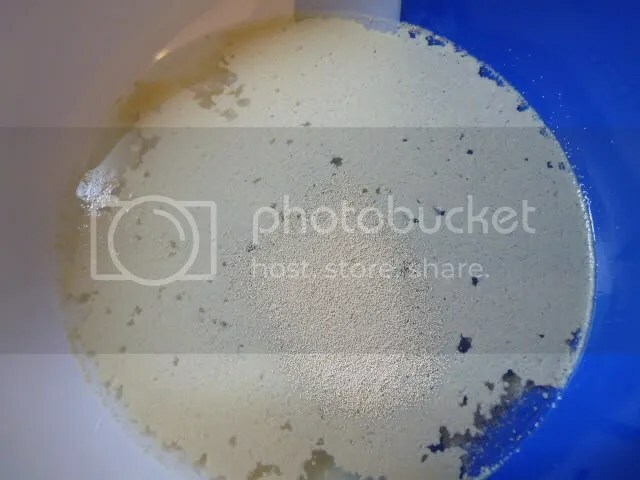 teacup, if you want to do an experiment, you try it with potassium chloride instead of sodium chloride (you can buy potassium salt in the supermarket in the salt section, it’s called NoSalt I think) – it might turn out the same, and would have no salt. I really have no idea what would happen – I’ve never tried that! What great tips! I used to make bread quite a lot years ago, but I’ve fallen out of the habit. Thanks so much for the recipe and the tip about using less water. This was an amazing tutorial. I don’t do too well following strict recipes, so your explanation of each step was perfect. Thank you!! 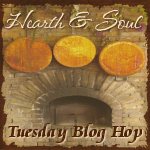 Thank you for sharing this wonderful tutorial with the Hearth and Soul hop! 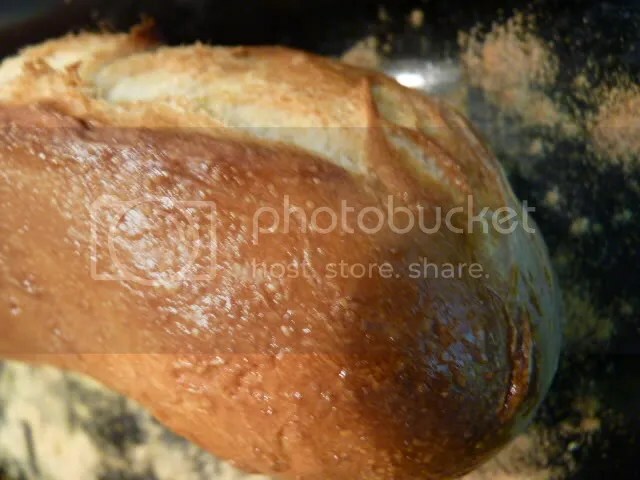 Your bread looks just beautiful, and your photographs and clear instructions make it sound very do-able as well. I love to make bread, and have made all different kinds, but I must confess I’ve never attempted a baguette. I think I will now! thank you April! good luck with it, I’m sure it will be delicious!